The Young Leaders Club of the Jennersville YMCA worked at the Jennersville Township Building on April 22. The volunteers spread mulch on traffic islands in the parking lot. 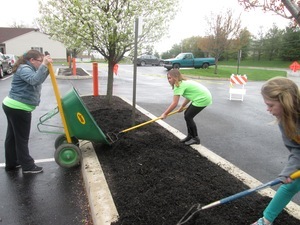 On April 22, young volunteers from the Jennersville YMCA dodged rain showers to help spread mulch at the Penn Township Building as part of their continuing service to the township. The Young Leaders Club, which is supervised by Elicia Bollenbach, the youth and camp director at the YMCA, has volunteered since 2014 to clean up and beautify the township building grounds in April and May. They've mulched, planted flowers and trees, and helped beautify the adjacent Penn Township Park. To mark Earth Day on Wednesday afternoon, the group bundled up against plunging temperatures and a cold rain to cover the four traffic islands in the township building's parking lot with a much-needed layer of mulch. The Young Leaders also help at the annual Community Picnic and Health & Wellness Fair, and volunteer at the Avon Grove Library. At the YMCA, they maintain and harvest a garden which supplies fresh food for the Chester County Food Bank. Their volunteer service saves money for Penn Township, which has only one facilities maintenance technician, Danny Peters, who was on hand on April 22 to guide the Young Leaders as they scooped mulch from a pile and spread it around the trees. Karen Versuk, the township's director of operations, has nominated the Young Leaders Club for the Youth Awards sponsored by the Pennsylvania State Association of Township Supervisors. If the group is selected, they could win a $500 prize and be recognized statewide for their service to the township.